Queen Elizabeth I spent much of her childhood at Hatfield Palace, which had been home to the Bishops of Ely since the Middle Ages. It was here that she learned she was the new queen, following the death of her half-sister Queen Mary. All that remains of the 1480 palace is a red-brick hall where banquets are still held. Beginning in 1607, Robert Cecil, the 1st Earl of Salisbury and younger son of Queen Elizabeth’s chief minister William Cecil (Lord Burghley), began constructing the present Jacobean mansion, using many of the red bricks from the demolition of Hatfield Palace. Robert Cecil had succeeded his father as a minister to Queen Elizabeth I, and after her death he served as chief minister to James I. It was from James I that Robert Cecil obtained Hatfield Palace. The king, much taken with Cecil’s Theobalds in Hertfordshire (now gone), offered to exchange Hatfield for Theobalds. Hatfield’s new construction took five years to complete and cost £11,000. 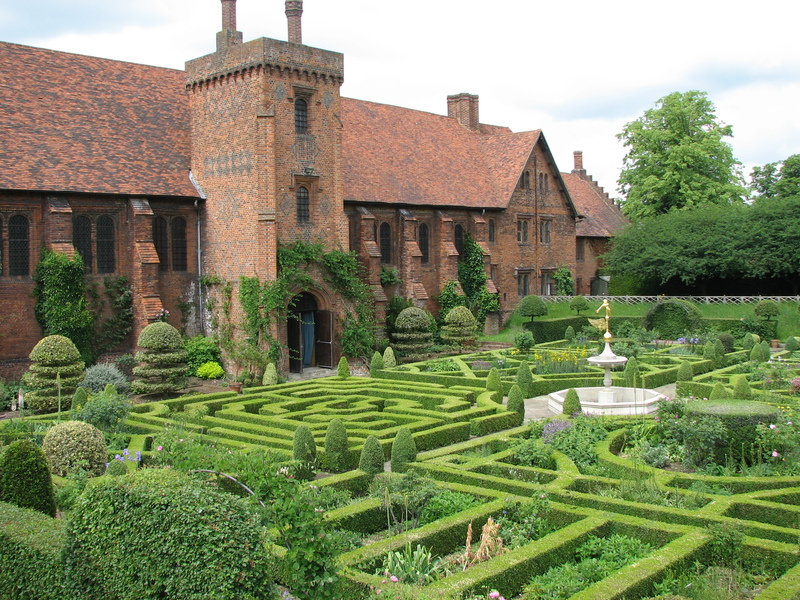 Robert Cecil died in 1612, just after the completion of Hatfield House. He is buried at the old parish church adjacent to the property. In the reign of George III, James Cecil (1748-1823) was created the 1st Marquess of Salisbury. The 3rd Marquess (1830-1903), served three times as Prime Minister to Queen Victoria. As chairman of the Great Eastern Railway, he was instrumental in getting the Hatfield Rail Station located just beyond the gates of his family home. Lord David Cecil (1902-1986), a noted scholar, historian, and author, grew up at Hatfield House. The house is still owned and occupied by the present Marquess of Salisbury and is one of the 10 Treasure Houses of England. With the advent of the railway, Hatfield’s entrance was reoriented to the north, where visitors now enter. The original south entrance was designed by Inigo Jones, who received £10 for his drawing. The original entrance is much more impressive with its long loggia flanked by ogee-topped double towers and a clock tower at the center. 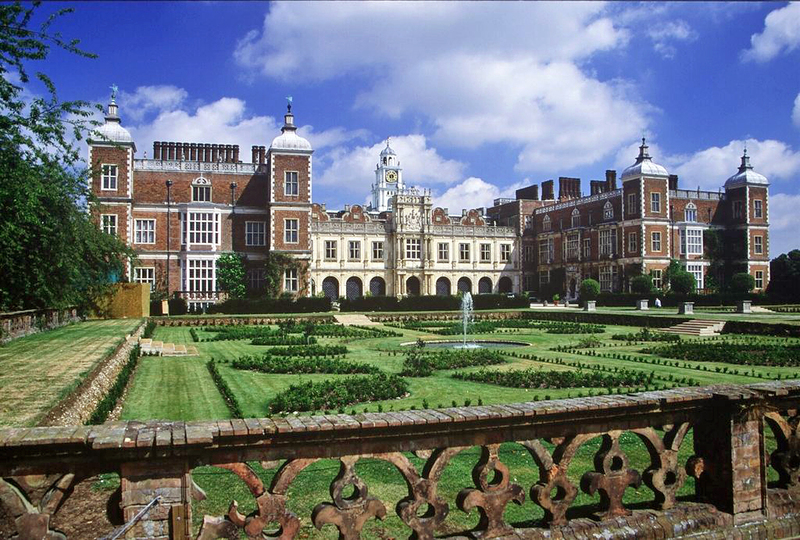 Hatfield House, comprised of 223 rooms, is considered the finest and best known Jacobean house in England. The marble hall on the ground floor, so named for its checkered floor of white and black marble, has retained its Jacobean appearance. Original, intricately carved wooden screens stand at either end of the chamber. The hall features a minstrels’ gallery and huge Belgian tapestries. World leaders today still gather around the long table that can seat 70. A climb up the grand Jacobean staircase (with original wooden dog gates) brings visitors to the first floor and the James I drawing room adorned with rich, deep greens and reds. Despite its large size, the room looks cozy with its intimately gathered conversation areas. A life-size statue of James I is incorporated into the overmantel. Walls are sheathed in tapestries which serve as a backdrop to a collection of priceless paintings, including those of Elizabeth I and of the 3rd Marquess of Salisbury and others painted by Reynolds and Lawrence. A trio of tall bayed windows floods the room with light. A 180-feet long gallery connects the James I drawing room on the east wall with the library on the western wall. The library is among the finest in England. A large fireplace is center point to the symmetrical room. Its north and south walls feature galleries that are balustraded in gilded iron and are accessible by handsome wood steps. The library houses many rare manuscripts, including letters from Queen Elizabeth I and Mary, Queen of Scots. The winter dining room was constructed in the early 19th century from two smaller rooms. Far more intimate than the hall, this dining room seats 14. Original to the home, the marble-floored chapel was remodeled in Victorian times but still retains the early 17th century stained glass windows depicting Biblical scenes. A tour of the house (guided on weekdays) includes the long, ground-floor gallery/loggia that is used as an armory and the massive original kitchen, which has been restored to look as it did in 1832. The 14-minute walk from the rail station is mostly through alleys of trees and alongside the broad lawn leading up to the present entrance. The 1,000-acre park offers vineyards, parterre gardens, a wilderness garden, a children’s play area, picnic sites, the 16-acre Broadwater, and park walks.–Cheryl Bolen is fortunate to have toured six of England’s Ten Treasure Houses.